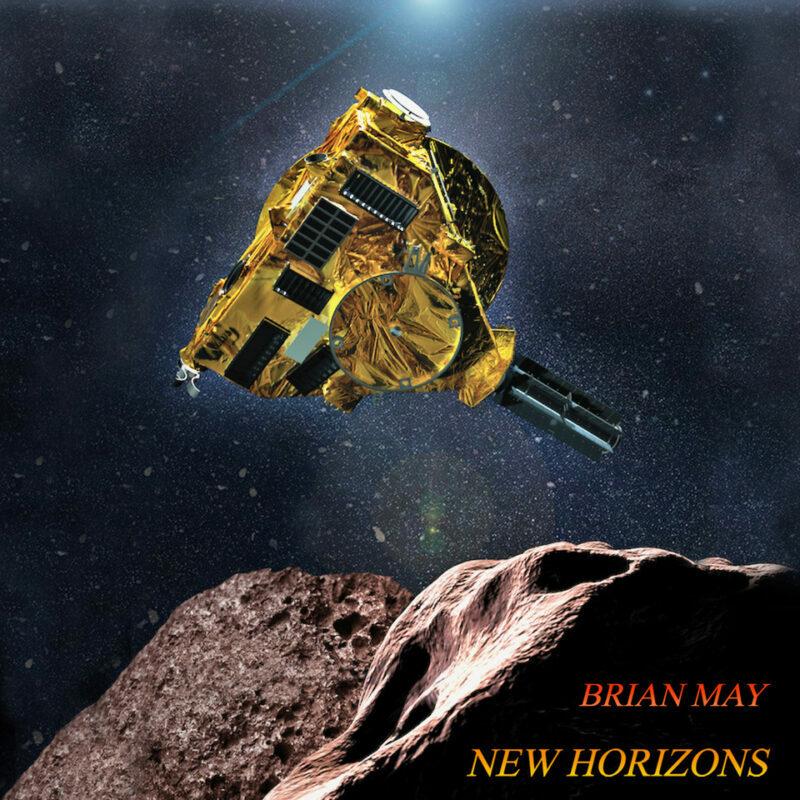 “New Horizons” cover. Courtesy of Queen Online. Dr. Brian May of Queen is set to release a new solo track on January 1,2019. This is his first new entirely solo project in over twenty years since “Why Don’t We Try Again” from his “Another World” album. The new track- written by May and Don Black- was recorded this month and will premier world wide on New Year’s Day. The song title “New Horizons” will debut from the NASA control headquarters in Maryland. Fitting, as this song is an homage to the NASA New Horizons mission and on New Year’s Day-when the song will release- the mission will have achieved the most distant spacecraft flyby in history. As Queen fans will know, May has a doctorate in astrophysics. He is also a collaborator with New Horizons. He will be present in Maryland when New Horizons passes the reaches of Pluto to the Kuiper Belt Object (KBO) named Ultima Thule. May was also present when Horizon passed Pluto in 2015. The track includes a message from Stephen Hawking congratulating the New Horizons’ team on their success from the probe three years ago. “New Horizons” will premier world wide on a live broadcast as 12:02 am EST from the New Horizons control center in Maryland when contact with Ultima Thule has been confirmed. This project has energised me in a new way. For me, it’s been an exciting challenge to bring two sides of my life together – Astronomy and Music. It was Alan Stern, the Project Instigator of this amazing NASA Mission, who threw down the glove last May. He asked if I could come up with a theme for Ultima Thule which could be played as the NH probe reached this new destination. I was inspired by the idea that this is the furthest that the Hand of Man has ever reached – it will be by far the most distant object we have ever seen at close quarters, through the images which the spacecraft will beam back to Earth. To me, it epitomises the human spirit’s unceasing desire to understand the Universe we inhabit. Everyone who has devoted so much energy to this mission since its launch in January 2006 will be feeling they are actually INSIDE that small but intrepid vehicle – only about the size of a grand piano – as it pulls off another spectacular close encounter. And through the vehicle’s ‘eyes’ we will begin to learn, for the very first time, what a Kuiper Belt Object is made of. And pick up precious clues about how our solar system was born. The song has been teased on with trailers social media garnering over 200,000 likes already and on ‘Bri’s Soapbox‘.